Technology-wise 2014 saw a lot of hype about new flexible plastics. Innova’s GStar (& Discmania’s G-Line) debuted early in the year while the Trilogy Brands’ flexible offering came in late November. These are not the only flexible, shock-absorbing, & hardening-in-the-cold resisting materials out there. Let’s take a look at these new plastics along with some old reliables you may have missed – or not have considered for cold weather rounds. I am going to slim the list down and say that “GStar” will refer equally to Innova’s GStar & Discmania’s G-Line. “Frost” will cover Latitude 64’s Frost, Westside’s Elasto, & Dynamic Discs’ Fluid. “Neutron Soft” is obviously the same for MVP & Axiom (One big cheer for MVP keeping the plastic name the same between the brands!) Any other plastics are exclusive to their brand. Frost, Elasto, GStar, & FLX are just some of the Flexible materials available for your winter rounds. The latest (at time of this post) entry into the flexible offering is “Frost”. Unlike GStar & FLX this is based on the Trilogy brands’ premium translucent plastic (Opto) rather than their premium grip plastic (Gold Line) as Innova & Discraft had done earlier. Even though Frost is based on Opto it is a bit more flexible than Innova’s GStar. It is still a rather dense plastic so it has a bit more durability than you might expect – considering its flexibility. GStar is based on Innova’s Star plastic and is just what seekers of hard-to-find gummy Star discs always wanted. GStar just happens to have very nice effects in the plastic that makes it shimmer and some colors even have sparkles mixed in giving it a similar look to Latitude 64’s Gold Line. GStar has a very nice balance of flexibility (to absorb impacts & add grip in the cold) and rigidity (to hold its shape in flight and return to shape after impact) but watch out on those hottest of summer days when it seems like all your discs are melting. You should certainly go back to Star or Champion at those times. Other than those hottest of days it is hard to start throwing GStar and consider going back to Star. GStar is one of the nicest feeling plastics when you pick it up in the shop. Discraft’s “ESP FLX” (what Discraft technically labels it as) is a more flexible version of their premium grip plastic. 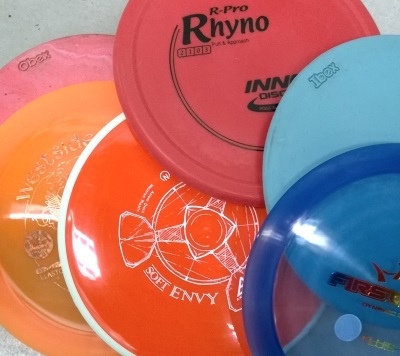 This is the best option if you are looking for a year-round disc that is more flexible than the standard premium grip plastic that won’t get too mushy in the summertime heat. FLX was the first plastic marketed as a wintertime specialty and it still works very well in that respect. GStar & Frost eclipse FLX in the flexibility game but FLX will be much more useful in warmer weather than those other two for that same reason. X-Link Medium & Soft, R-Pro, Elasto, Neutron Soft, & Fluid are some more cold weather grippable options. About a year after Discraft released FLX Innova released R-Pro which is a more flexible version of their long standing Pro plastic. R-Pro is a flexible base grip plastic so it isn’t going to go too far in terms of durability. It is great for putters (especially if you use DX plastic in the summer) and has superior grip when wet (compared to a slicker plastic like Star) but once you start bashing R-Pro plastic into frozen trees, rocks, & ice for one or two rounds you’re going to want to reach for new backups next time out. Vibram makes the only compression molded rubber-based discs on the market. The compression molding gives their discs better “memory” to return to their normal shape after you bash them against a tree or allow a car to drive over your them. Vibram makes arguably the most durable material with the best grip for the bottom of hiking shoes and they do exactly the same for discs. The big difference for the terms of this article is that rubber durability (unlike plastic) increases with softness. The other inverse relationship rubber has to plastic is that the softer the rubber is, the more overstable it is too. That is a great quality to have when you are throwing into a headwind in the dead of winter with no leaves on the trees to block those gusts. XL-Soft is easily the most flexible material on this list. It is has just enough rigidity that it will not go floppy in your hand while snapping your throw but it will fall to the earth by just nicking the outside of the chains. “Hit & Stick” is what Vibram says and that’s exactly what XL-Soft does. These discs rarely roll away because they tend to just flop over when they land on edge. XL-Soft is a must-try for the winter warrior. A possible surprise in this list is Neutron Soft which was not specifically marketed as a winter time cold beater but I found it to be the 2nd most flexible offering in this list. As with any MVP disc, the overmolded rim has a denser material than the flight plate. The denser material gives it greater durability while the Neutron Soft flightplate allows it to flex more which will give you better grip in the cold as well as allow the disc to flex upon impact without making the entire disc softer and less durable. Just as with their regular Proton & Neutron discs this puts MVP’s plastic towards the top of the durability chart yet again. If you play year-round you will be best served by stocking your bag according to the season. Just as you wouldn’t throw a slick disc in the rain you don’t want to throw a hard disc in the cold. You cannot expect the softest disc in your bag (like an XL-Soft) to be as useful in the summer as it is in winter so if you are looking for an all-season option you might be best served by something on the lower end of flexibility like Discraft’s FLX. As you can see, there are some great options available for cold winter rounds and you do not have to sacrifice a lot of durability to gain some needed grip. Checkout my handy-dandy chart below displaying the relationship between each plastic’s flexibility & durability. 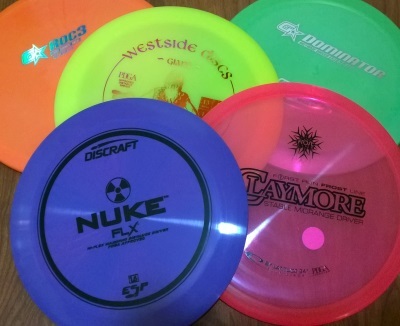 This entry was posted in Uncategorized and tagged Axiom, Discmania, Discraft, Dynamic Discs, Elasto, ESP FLX, Fluid, FLX, Frost, G*, G-Line, GStar, Innova, Latitude 64, MVP, Neutron Soft, R-Pro, Trilogy, Vibram, Westside, X-Link, XL-Medium, XL-Soft. Bookmark the permalink.